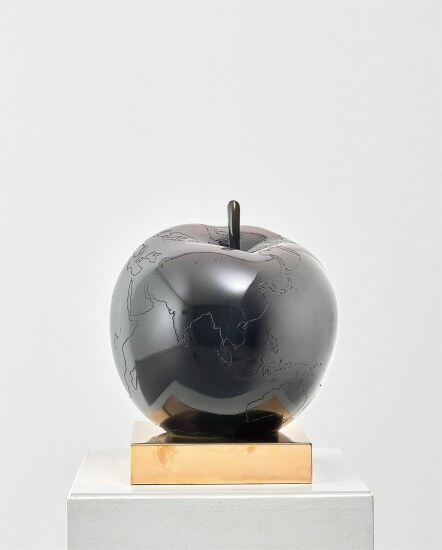 Black Diamond encapsulates the development of Nykyta Zigura's sculptural project he has been working on since 2015, replacing the Biblical story of most coveted fruit in Eden with an ironic depiction of man-made objects. In Nyingchi, China, the local farmers grow unique black apples that shine like diamonds in their flowering gardens. Residents of the small village take great pride in the unusual colour of these fruit, the technique for growing them being well-guarded secret, driving up the demand and volume of orders from around the globe. Subsequently, this precious apple is an object of desire for privileged communities and remains inaccessible to the broad public. This raises not only internal social questions but also addresses ecological problems important for mindful consumers (the artificial colouring of fruit from the Nyingchi province is at odds with the natural apple palette). Nykyta Zigura exchanges the colours which across centuries have been typical for the environment with cold metallic hues or striking vibrant shades of the streets of urbanized spaces. Black Diamond marks a profound attempt to draw attention to global climate change provoked by humankind’s wasteful approach to exhaustible resources. Executed in 2016, this work is number 2 from an edition of 8 and is accompanied by a certificate of authenticity signed by the artist.